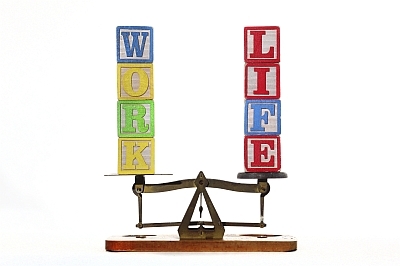 Work life balance means different things to different people and for many of us it no longer means working nine to five. Due to technology and social media, the boundaries are blurring between work and home and it's becoming hard to separate work and non-work. There are many good reasons as to why you should improve your work / life balance, but the most important one is for the benefit of your health. Spending too many hours at work or thinking about work can result in stress, sleep deprivation, depression, being burnt out and unhappiness. We need a good balance between work and rest to give our bodies time to relax, refresh and find balance. It's important to know when you're stressed that you aren't being productive anymore. A diary full of work commitments. Sometimes forgetting to eat lunch. Spending less time with your family than you do with your colleagues. Having no time for sports or hobbies that you used to love. Spending more time talking to work-related colleagues and contacts on social media than you do with your friends and family. Finding it hard to part with your phone or laptop - even late at night or on the weekends. Feeling stressed or suffering from insomnia. Being too busy for time off or a holiday. You don't necessarily need to make big changes in order to bring more balance into your life. If you don't have much control over the hours you have to work, you can ask yourself what other ways you can bring more enjoyment and relaxation into your life. The trick is to learn to focus your time and attention on the things that you can control. Be open about your needs whether you work for someone else, or are self-employed, we can all benefit from having an open and honest conversation about what balance means for us and whether this is possible to achieve in the workplace. Perhaps it's leaving the workplace at lunch, starting earlier so you can leave to get to that yoga class or having the flexibility to work from home on occasion. Set and respect your boundaries. You need to respect the boundaries you put in place. It might be something simple, like not checking or replying to work emails after 7pm. Boundaries help to establish your routine, create habits and a sense of balance. Work, Rest and Play. A good rule of thumb was the 8 hours work, 8 hours rest and 8 hours play. Focus on what really matters. Often we waste time on the things that don't really matter or which don't add much value. Learn to prioritise those tasks that really matter, focus on outputs. Embrace the 'Off' button. It might sound simple enough, but using the 'Off' button can be a lot harder than we think. Start small perhaps by not using the phone at dinner or after a certain time in the evening. When on holiday be on holiday. By 'unplugging' we can start to really enjoy the moment and we are more present. Use technology to your advantage. Technology offers many shortcuts likely online shopping, bill payments and video conferencing as well as many useful apps. When used wisely these tools can save time every day. Schedule and manage your time. If you start to monitor your time closely you can see where it is being wasted and find ways to do things smarter and faster. Start to prioritise the things that need to be done first. Take short breaks / plan a holiday. Plan important family commitments, holidays and outings. Take time out for yourself. Slow down and pace yourself. Life is not a race. Often the pressure we feel can be self-imposed. There are times when you may need to apply a little more pressure, and times when you don't, learn to slow down and work out what is really important. Ask for help if you feel like things are out of balance or that you may be suffering from burn out or stress, then it is important that you seek help. Talk to your manager, friends or loved ones.